LAHORE: Sikh pilgrims arrived in Lahore on Friday from India to partake in the annual Baisakhi celebrations from April 12 to 21. On Tuesday, the Pakistan High Commission in New Delhi issued visas to Sikh pilgrims from India to participate in the annual celebrations. 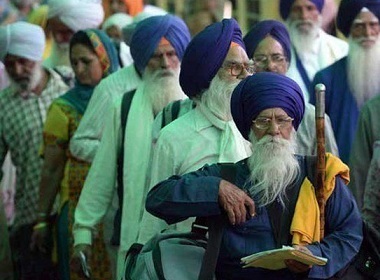 According to a press statement from the High Commission, the 2,200 visas issued were in addition to the visas granted to Sikh pilgrims participating in the event from other countries. Baisakhi is an ancient festival which marks the beginning of a new harvest season. Under the framework of the Pakistan-India Protocol on Visits to Religious Shrines of 1974, a large number of Sikh Yatrees (pilgrims) from India visit Pakistan to observe various religious festivals and occasions every year. During their visit to Pakistan, the pilgrims will visit the holiest shrines of Panja Sahib, Nankana Sahib, and Kartarpur Sahib. The issuance of these pilgrimage visas is in line with the Government of Pakistan’s efforts to facilitate visits to religious shrines and strengthen people-to-people exchanges, said the High Commission in the press statement. "This also reflects the commitment of the Government of Pakistan to faithfully implement the 1974 Protocol on Visits to Religious Shrines. Pakistan remains committed to preserving sacred religious places and extending all possible facilitation for the visiting pilgrims of all faiths," it added.